Navagraha homam is considered one of the auspicious homa to remove the navagrah dosha.The navagraha plays a vital role in deciding ones day to day activities. If 4 or more of the planets are not well placed in ones natal chart, navagraha homam should be performed.It is also performed if Rahu(Ascending node) and Ketu(Descending node) are afflicted. Navagraha homam is performed if one has kalathra dosha or kala sarpha dosha.The dosha should be nullified in the natal chart to see improvements in marital life and career. 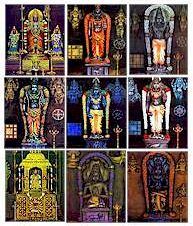 The head of the navagraha is Sun followed by Moon, Mars, Rahu, Jupiter, Saturn,Mercury,Ketu and Venus.Most of the navagraha temples are situated in Tamil nadu. Navagraha puja and navagraha mantra can be performed daily in the morning hours. The online pooja for Navagraha can be performed on your behalf.